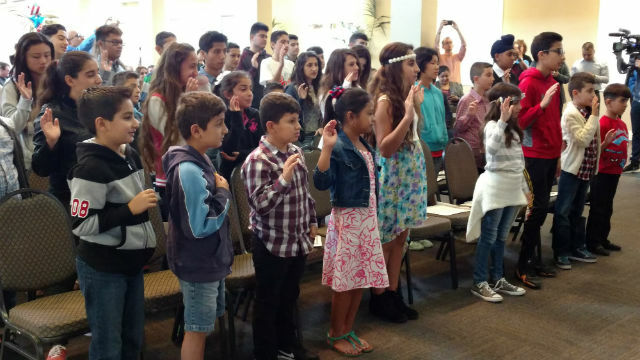 San Diego welcomed 47 youths from 13 countries as new American citizens on Friday, with Mayor Kevin Faulconer leading the pledge of allegiance. 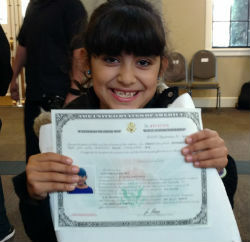 The youths, aged 4 to 25 but mostly children, became citizens at the New Americans Museum in Liberty Station. The largest group, 33 in all, were from Iraq, but others came from Vietnam, the Philippines, Turkey, Guatemala, Mexico, Jordan, Egypt, Russia, Saudi Arabia, India, China and Germany. One of the new citizens holds her certificate. “Today you will become part of the people of America,” said Rep. Loretta Sanchez, who said her mother, father and grandmother were all immigrants, and her grandmother became to citizen expressly to vote for her. The museum’s founder, Deborah Szekely, was daughter of immigrants from Eastern Europe, and married one as well. She founded the museum to help native-born Americans understand immigrants and their impact on art, music and literature. “Becoming a U.S. Citizen is not only an honor but it represents the future,” she said. 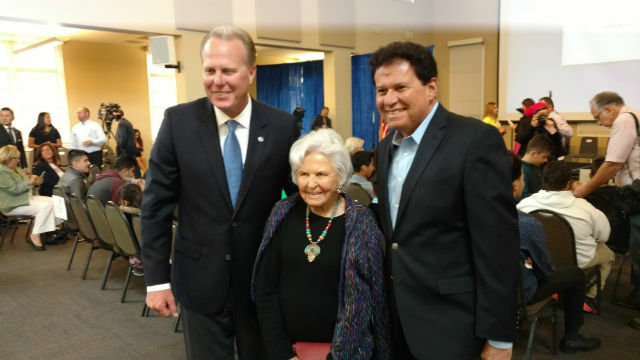 Deborah Szekely with Mayor Kevin Faulconer (left) and state Sen. Marty Block.